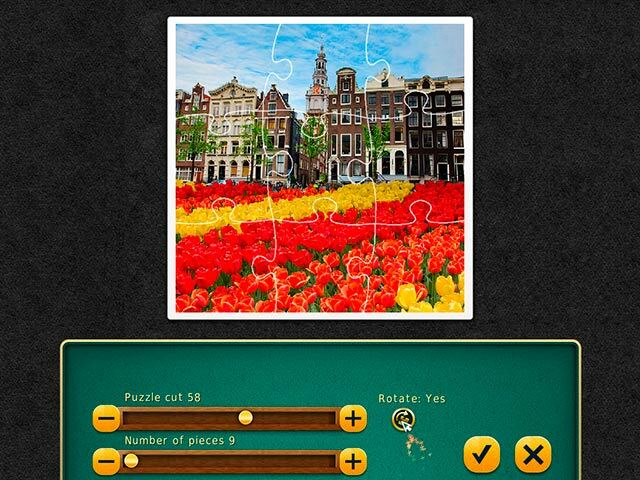 Before you set off to your next destination, play Jigsaw Tour 2! Venice, Chicago, Peking, Munich, Athens... 700 photographs of famous sights in 7 of the most beautiful cities of the world. What's the Carnival of Venice like? What do they eat in Peking? What should you bring back as a memento from Munich? Where is the birthplace of the sacred fire of the Greek gods? Find out everything a city is famous for in the world of tourism. Experience culture and tradition in the comfort of your own home. Travel around the world with Jigsaw Tour 2! See architecture, monuments, art, national clothing, cooking and souvenirs. Enjoy high quality images, intuitive controls, in-game help, and heaps of clues and tools to help you configure the game to your liking. Special tasks and trophies make the game even more entertaining. Try the original Jigsaw World Tour! 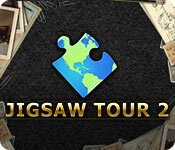 Jigsaw World Tour 2 is rated 3.1 out of 5 by 11. Rated 5 out of 5 by Tufty57 from A visually appealing stress-buster I imagine that many will find this a thoroughly relaxing way to spend a short or a long time. It is probably a game that they might keep on their computer, returning to every now and then. It is not something that they play all day because they just have to finish it. There are 7 beautiful locations to visit and for each location there are 13 pages with up to 8 puzzles on each, ranging from 12 pieces to 247. Some puzzles require you to rotate pieces in order for them to fit and some are simple placement. There are 7 trophies to be earned for spending time playing, matching a number of pieces, precision etc. each with a number of 'levels'. For bigger puzzles with a lot of pieces there is a 'pocket' to tuck away pieces while you eg build the edge. You can modify puzzles too, increasing the number of pieces, changing the 'cut' and adding/removing rotation. All the while you are listening to soothing music, though sadly it is the same music for every puzzle. One 'niggle' is that the menu reverts to the Chicago page 1 after each puzzle so if you want to play Venice for a while you have to keep clicking the tab and finding the page. But that is no great hassle. As a novice, I initially found the bigger puzzles overwhelming, but once I began to use the 'pocket', the tools at the bottom to help me sort the pieces and the image or ghost tool to preview the finished picture, it was less so. I can see why these are popular games. I guess, as a bit of a traditionalist, I prefer the 'real thing' but this does not take over your dining table for weeks and the dog cannot eat the vital piece! Thoroughly recommended to try and I might just use a coupon on this and keep it there for a bit of stress busting. Enjoy! Rated 4 out of 5 by pennmom36 from A Puzzling World I wasn't as thrilled with the 700 puzzle pictures available in World Tour 2. This edition has puzzles available for Chicago, Venice, Amsterdam, Athens, Beijing, Barcelona and Munich. There are 7 different trophies to earn, each with several categories. You can customize any of the puzzles by choosing how many pieces, the shape of the puzzle pieces and whether you want the pieces to rotate or not. You can choose to show an image picture in the top left corner in three different sizes, you can ghost the image on the background and you can choose from 4 different background colors. You can choose border only, there is a sort option and hints are available as well as a magnifying glass and a box to store excess pieces, enjoy! Rated 4 out of 5 by JustTheFacts from Beautiful If Predictable BASED ON DEMO IN BRIEF This is an 8 Floor game which, to experienced purchasers of Jigsaw, Mahjong, and Fill & Cross games, is all that you need to know to know exactly what you’re getting. They are nothing if not consistent. The game opens in widescreen – nice! And looks very good. The pictures in the album to choose from are professional and vary in subject matter across a good range of destinations. Although I’d never have thought of Chicago as a tourist destination. The other cities are: Venice, Amsterdam, Athens, Beijing, Barcelona and Munich. 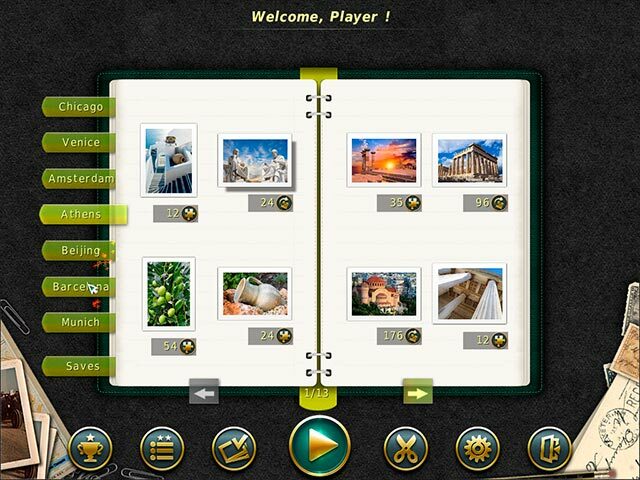 The usual features are available: rotate, change number of pieces and the degree of variance in the pieces (390 max), hint, separate the border, magnifier, ghost, image and a sorting box. There are also a few trophies to be won and a top scores list. Mostly, there are excellent photos and endless variety – which at least makes up for the stoic adherence to their game structure that 8 Floor seem to wear as a badge of honour lol. Rated 3 out of 5 by eponym from Size I was not as bothered by the flashing lights as I was by the size of the puzzles. If I tried to enlarge them by changing the resolution they became grainy and unappealing. Also, unlike many I found the music to be an annoyingly short loop. It was so repetitious I turned it off and turned on my own. As for the pictures themselves. Some were so terrible that I wondered why they were included. I am still playing it occasionally, or shall I say until something better comes along. I think that all of the developers must take vacations around the same time. Periodically every year there are lulls. This must be one of them, the World Cup perhaps? Rated 3 out of 5 by beachsidelynn from Light Flashing, Oh No. Certainly not Jigsaw Galore. I played the original Jigsaw World and loved it. That's because "Galore" wasn't out yet. I only wish there would be another release of Jigsaw Galore with more pictures. It's a great game. The light flashing when pieces connect and the music are off putting for me. As always try the demo yourself. Rated 3 out of 5 by Shauntie1 from Jigsaw World Tour 2 There is no option on moving the pieces. You have to hold down to place or move them. This seriously taxes the carpal tunnel. I have Jigsaw Galore by David P Gray which was distributed by BFG and there just is no comparison. 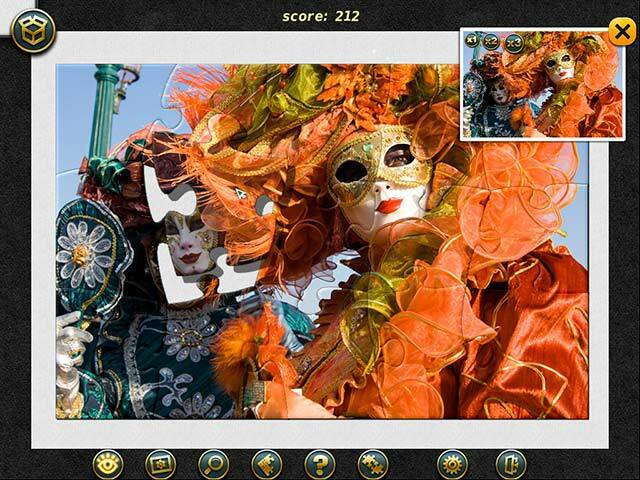 Jigsaw World Tour 2 has great pictures of foreign countries and captures the cultures quite nicely. Was just disappointed by the mechanics. The music is nice and relaxing. Couldn't play for long because of the pieces not being able to stick to my cursor while I chose where to place them. Rated 3 out of 5 by Cowski from light flash I really do like this game, except for the light flash, that is why I m not buying it. Everytime a flash when connecting pieces is too much. Rated 3 out of 5 by Classicaljazz from If They'd Lose the Flashing Light, I'd Buy This One How disappointing!!! Another BEAUTIFUL jigsaw puzzle game created by the 8 Floor developers WITHOUT the option to disable the "feature" of the bright flash of light each time the player fits a puzzle piece in the correct place. ;( I love the georgous puzzle pictures in all the jigsaw games I've seen from this developer... and they seem to have enough puzzles in each game to keep a jigsaw puzzle lover like me happily busy working the puzzles for weeks and weeks. But it is a no-buy for me because the flashes of light tend to give me headaches... or make a headache I already have get worse. I've seen other postings with a similar complaint from folks who have tried the 8 Floor developers' jigsaw puzzle games. Adding an option for players to disable the flashing "feature" would probably bring in more sales for the 8 Floor developers, for customers could choose to turn off the flashing light if they wished... or the ones that like it could leave it on. How difficult could it be to include that option in their future jigsaw puzzle games ! ! ! ? ? ? I sure wish they would add that option. I'd be waiting in line to buy one or more of their beautiful jigsaw puzzle games!!! Classicaljazz P.S. I gave this game 3 stars and said I recommend it because I realize that the flashing light might not be a problem for many others. Rated 2 out of 5 by psylocibin from what I want in a jigsaw game I want to know where the border of the picture is. I like when the pieces click into place. I like when the shapes are unusual as well as typical jigsaw shape. I like Jigsaws Galore so much better. I like being able to make changes in depth of the pieces and having a lot more control over the way they look. I like having the ability to decide if I want to rotate or not. I like the pictures to be very clear and not murky which this game did fulfill. Of course you should try it and see what you think. Rated 2 out of 5 by Bfishy from options shmoptions The only option I want to see is less cliking...don't care about background colors or rotation....just want to pick up a piece and move it without having to hold down a button on my laptop with my thumb while I swivel my index to move the piece. Seriously. People who have time to play such games as puzzles have arthritis and other problems....they just want EASY on the hands.....they don't care about the bells and whistles so much. I have bought several puzzle games looking for what I need and Playtonium's Jigsaw 365 is the only one I've found at Big Fish. So Big Fish, how about finding some more that operate like that one?